AFE Crane has been providing standard and customized overhead material handling equipment since 1983. Previous to 2016, AFE Crane was known as American Fabricators & Engineers at which time we updated our name to AFE Crane, reflecting our core business of overhead cranes. 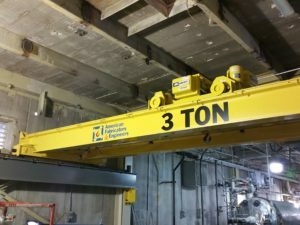 We provide a wide range of equipment, from slings and chain hoists to custom below the hook lifting devices and complex automated monorail carriers, specialty cranes, and stackers. We are respected distributors for multiple hoist and overhead equipment manufacturers and offer both new equipment as well as repair parts. Our experienced applications engineers are based out of Davenport, Iowa & Fort Dodge, Iowa. Together we will work hand-in-hand to review your overhead lifting projects and develop effective equipment solutions that increase your productivity while minimizing investment costs. AFE Crane engineering and fabrication facilities are located in Cedar Falls, Iowa. Our engineering group uses the latest drafting software to design and fabricate complete overhead material handling systems to industry safety and performance standards. We excel at creating new lifting solutions or re-engineering and reworking existing systems to increase lifting capacities, spans, and modernizing controls. Our design team will create an effective solution and put together a mechanical and controls drawing package for the end user’s reference. Fabrication takes place in our two Cedar Falls manufacturing facilities that total 70,000 square feet of extensive machining, fabrication, welding, assembly, and painting equipment. We share these facilities with our sister companies Laforge, Bruns Machine, and BucketMaster. Our service group will keep your equipment running with our experienced inspection and service technicians. 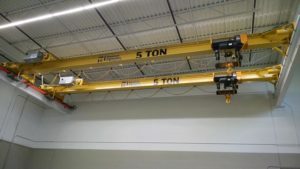 AFE Crane technicians are familiar with industry leading brands of overhead cranes and hoists and are experienced with inspection, troubleshooting, repairs, and equipment upgrades. For over 30 years AFE Crane has been helping our customers become and stay productive. We look forward to solving your overhead lifting challenges and keeping your existing equipment working safely.